I’ve spent the last two days at the University of Trier in Southern Germany. 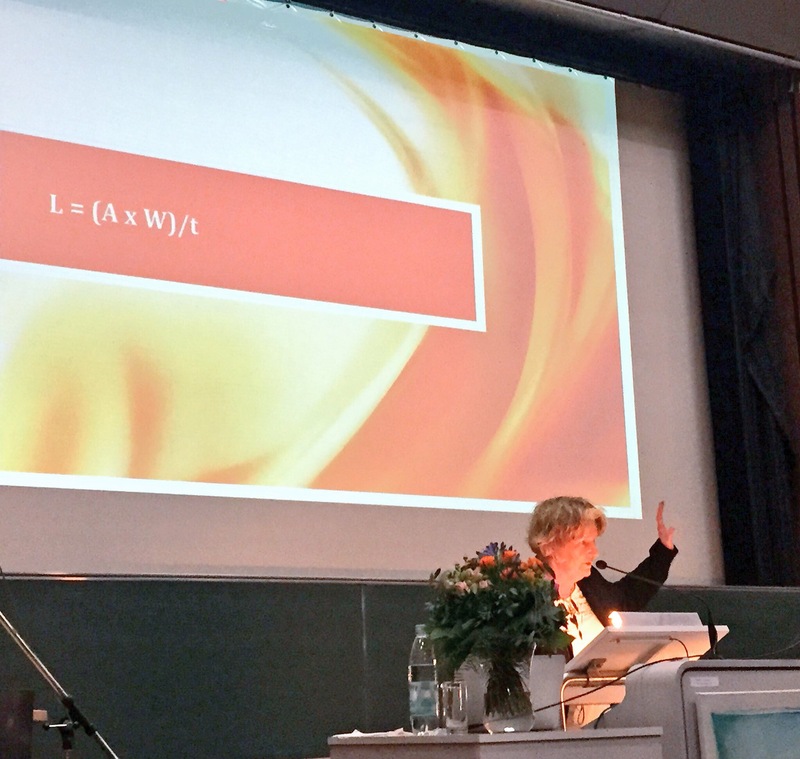 The university hosted the very first conference of the “German Association for Research in Positive Psychology” (DGPPF in German). I’m so excited about the fact the Positive Psychology is finally picking up momentum in my country. Unfortunately, I was not able to attend all the workshops and lectures as I had a lot of work to do on the side. As I’m not a researcher myself, I contributed by hosting a workshop on marketing research(ers) to the press and via blogging. The one takeaway that inspired me the most was the closing slide of a lecture given by Prof. Dr. Michaela Brohm who also happens to be the founding president of the newborn Positive Psychology association. She proposed we need a new formulation for “good work” by drawing upon a well-known formula from physics – where power (or output) is defined as the amount of work / time. Brohm referred to this as “cold work”. I love the notion that work and wellbeing are linked via a multiplicative function – because this implies that work which does not foster the (psychological) wellbeing of the worker potentially devalues the whole outcome of the process – whereas work that also builds wellbeing drastically increases the value of the investment. Brohm called this “warm work”. I firmly believe we need this kind of catchy simplification because a prompt like that helps us to remember the core messages long after a talk or lecture. Most managers behave as if they were still in high school. The primary goal is not being laughed at. This sentence resonates with/in me ever since I’ve heard it three days ago. Professor Robert Quinn, co-founder of the Center for Positive Organizations at the Ross School of Business (Michigan) coined it during a workshop on building positive cultures which was part of the Positive Business Conference 2016. This is, of course, not the first time someone explained to me that most organizations create an atmosphere of (more or less) constant fear. But I have learned over the years that, in order to really grasp a “thing”, somebody has to present it to you at the right time in just the right words. I was so impressed after the workshop that I instantly bought his book Lift: The Fundamental State of Leadership (co-authored with his son Ryan) at the book table and devoured it on the plane back home from Detroit to Frankfurt, Germany. And what can I say? It´s one of the best books on leadership I´ve ever read. Truth be told: I read a lot of management and psychology books (broadly speaking) and most authors on interpersonal leadership leave me rather unimpressed. I´m a senior human resources manager working in the headquarter of a multinational organization of 120,000 people, leading a team across two continents, additionally being responsible for groups of people that are part of our international trainee programs, and coordinating the efforts of multiple agencies that support us in recruiting and employer branding. Against this backdrop, I can honestly say: Leadership is not easy. It doesn´t come down to checklists and simple recipes. Instead, it can be immensely taxing and challenging: It´s hard work. That´s why I enjoy leadership books that acknowledge and appreciate this basic condition. Robert Quinn´s “Lift” is such a book. It draws on a useful metaphor from aerodynamics (the dynamic that makes objects fly even though they are heavier than air) but more importantly, is grounded in decades of top-tier research. The framework that serves as the outline of the book is based on an influential article in the journal Management Science from 1983, A Spatial Model of Effectiveness Criteria: Towards a Competing Values Approach to Organizational Analysis that aims at describing the basic dimensions of organizational effectiveness. 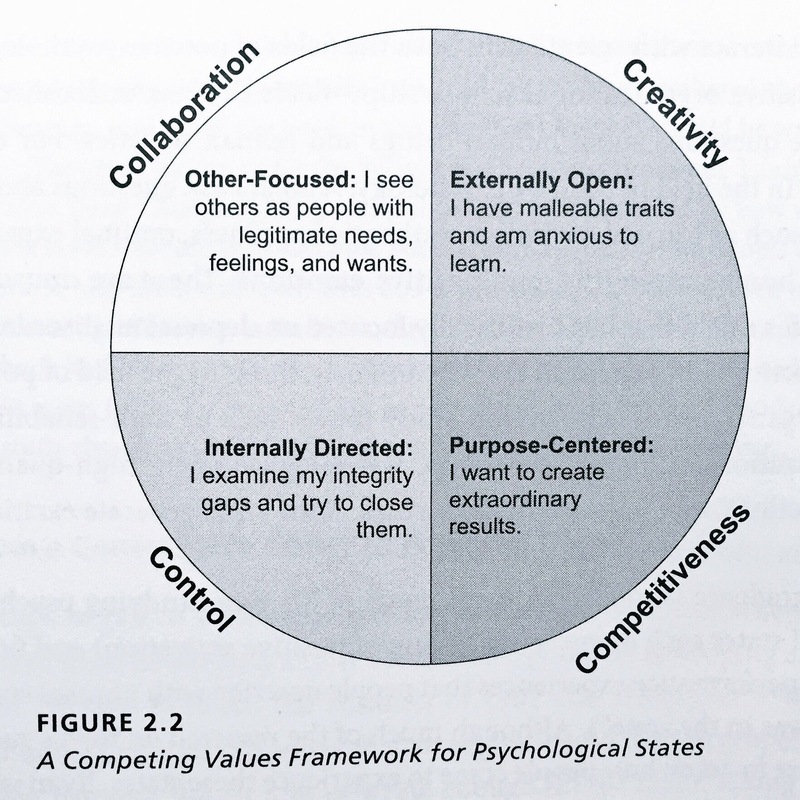 Quinn takes this framework and uses it to outline four corresponding psychological states of leadership: Purpose-centered, internally directed, other-focused, and externally open. This is the crucial point that differentiates “Lift” from most other leaderships books: It doesn´t tell (aspiring) leaders what to do on a concrete level. Instead, it serves to cultivate a certain mindset, a stance, a leadership conduct – what the author terms the fundamental state of leadership. The author proposes we can enter this special mindset when we (implicitly or explicitly) apply a set of questions to given leadership situations, especially those that bear potential for resistance and conflict. These questions correspond to the four quadrants of the effectiveness/psychological states model. What results do I want to create? (objective: becoming less comfort-centered and more purpose-centered). What would my story be if I were living the values I expect of others? (objective: becoming less externally directed and more internally directed). How do others feel about this situation? (objective: becoming less self-focused and more other-focused). What are three or more strategies I could try in learning how to accomplish my purpose? (objective: becoming less internally closed and more externally open). they provide a clear definition of the situation, focusing people´s attention. Most management books I read – whether I enjoyed them or not – don’t nudge me to do anything differently afterwards. I put them in a shelf and hope, at best, to remember one or two good ideas. With “Lift”, it´s a different story. I have already printed out the four questions and I will stick them to the computer screen in my office next Monday. And I will use the aforementioned definition to further mold my individual purpose. To learn more, you might want to watch Quinn´s 2013 TEDX talk.